The Philippines town of El Nido offers an embarrassment of choices for the budget traveler; pension houses and beachfront cottages often go for as little as $20 a room. The low-cost hotels and resorts listed here leave more room in the budget for hiking, island-hopping, and more of the many activities you can do in this laid-back Palawan beach community. If you're willing to pay more to get the creature comforts you're accustomed to, read Mid-Range and Luxury El Nido Hotels & Resorts instead. The first flashpacker hostel in El Nido falls squarely in the middle of the gaping gulf between El Nido's luxury beach resorts and funky budget pension houses. The common bathroom's shower stalls have individual doors, not curtains, to guarantee privacy. In the nest-like public space, guests can participate in communal activities like Scrabble tournaments, darts and Jenga matches. 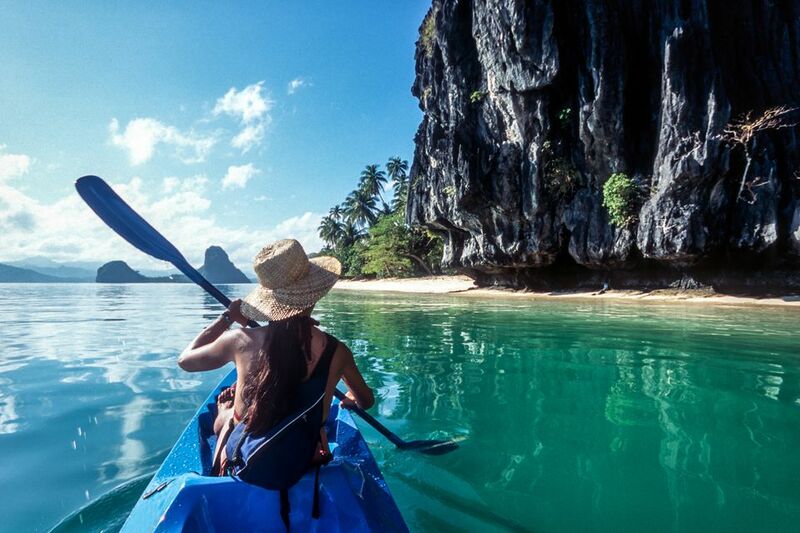 Tours to the rest of El Nido can be arranged upon request. Guests get a choice of one of seven fan-cooled rooms in a very traditional-looking house next to El Nido Art Cafe. The hostel's new extension down the street comes with one private room and one six-bed dorm room. Coffee, tea, and potable water comes free to guests; WiFi is also free, but somewhat temperamental. Spend your evenings at the excellent verandah: chill out and shoot the breeze here with fellow guests. This is not a beachfront property, but it's located one minute's walk from the beach. The rooms feature detached and duplex-type cottages for rent, clustered around a green space. Keep expectations low: the food is adequate and the accommodations are comfortable, but as creature comforts go, you get what you pay for. The property is expansive, though: you won't feel hemmed in by fellow guests. The beach is immediately visible from the green space in the middle of the resort. A choice of fan and air-conditioned rooms is available. More sporty guests can take advantage of in-house boats, kayaks, and snorkeling gear, all available upon request. The rather steep hundred-step climb to the El Nido Viewdeck Inn might turn off some mobility-challenged visitors, but the effort is worth it: you get some distance between yourself and the sometimes-noisy town below, you'll enjoy cooler breezes than those properties at sea-level, and the view from the property is quite simply amazing. As far as accommodations go, don't expect too much beyond bamboo cabins with private showers, electric fans or air conditioning, and private balconies. El Nido beach is only a 10-minute walk away from the inn. The Tapik experience feels like it's off, off, off the beaten path. If wood, bamboo and thatch huts in front of the beach isn't rustic enough for you, the owners can organize an overnight camping trip on another beach on an island in the bay. The main property in El Nido offers accommodations in solar-powered huts, and gets back to nature in almost every way possible: the staff catches and cooks fresh seafood for guests' consumption, but the wide-open huts allow insects to attack from outside. (At night, guests sleep under mosquito nets, cooled by electric fans.) Bathrooms are shared with other guests, electricity only runs in the evenings, and WiFi is near-nonexistent. But who's concerned about electricity and evening mosquitoes, when there's the rest of El Nido to discover? Have the hosts arrange an island-hopping tour, or explore the beach on your own: the rustic charm of Tapik only works if paired with the rest of the island experience. The rooms are small and the bathrooms are even smaller, but the terrace overlooking the beach is the Dayunan's saving grace. Watch a sunrise from here, and start your day in El Nido right! Rooms come with television and air conditioning (though the units are quite old). There is WiFi in the rooms, as well as free WiFi on the property in the lobby. Breakfast is included in your stay. The Dayunan's central location in El Nido town allows guests to access boat tours, shops and restaurants immediately upon exiting the property, not to mention the beach, which is less than three minutes' walk away. Image © Rovic's Pension House, used with permission. For its budget price, you get a little more than expected: almost instant access to the beach, options for air conditioning, and breakfast - plus, kids below 3 years of age stay for free! Ten rooms offer comfortable if spartan accommodations; if the rustic rooms don't appeal, try the related property Rovic's Tourist Hotel right across the street.